If you are left-handed then you know how annoying right-handed scissors are and now there is a t-shirt that is all about that. You can get this shirt in styles for men, women, and kids and you can these shirts in many sizes and colors too. 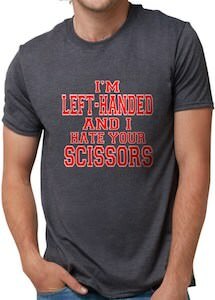 On the shirt it simply says “I’m Left-Handed And I Hate Your Scissors” in red letters that have a white border to make them stand out nicely on the shirt. So now you can show all your right-handed friends that they should get a pair of scissors for their left-handed friend.